Multi-year research on two populations of the endangered endemic Carnaby’s cockatoo in southwestern Australia was conducted in order for two separate methods for nestlings aging to be assessed. If accurate enough, Dr. Denis Saunders and his team believe that the results could be vital in the threatened species’ preservation, as explained in the Carnaby’s cockatoo’s recovery plan. One of the methods they have looked into is based on changes in the physical appearance of nestlings over the 10-11 week nestling period. The other relies on measurements of a nestling’s folded wing length and its comparison with growth curves from measurements of nestlings of known age. In their paper the Australian team also examines the timing and length of the egg-laying season. Their research is published in the open-access journal Nature Conservation. The researchers point out that accurate nestling aging is essential for many ecological studies. The data could be used in investigating population dynamics, life histories, behaviour, longevity, conservation planning and management. It could also help in scheduling the visits of breeding areas so that the disturbance for the populations is minimised without compromising the results. The scientists found out that observing the changes in a nestling’s size and feathers is less accurate than measuring the folded wing length. Its main disadvantage turned out to be the lack of distinguishable physical changes once the birds become about nine-week-old. However, “with experience it may be useful for gaining an approximation of the commencement and end of the breeding season without having to handle nestlings to take measurements,” the team says. 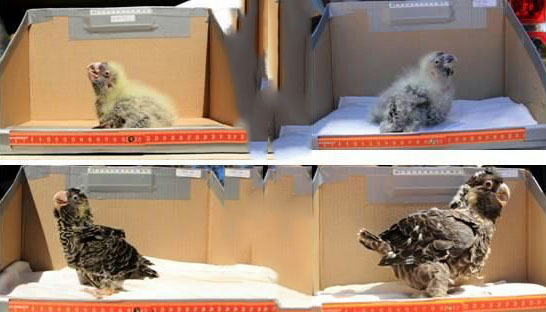 Their research on the egg-laying dates concluded that the most effective approach for examining nestlings is to conduct two visits per breeding season. Curiously, their findings showed that in wetter autumns the egg-laying begins earlier. The team also suggests that their methods could be adopted for aging the currently under-researched closely related Baudin’s cockatoo until more species-specific technique is found.